If you are interested in joining the club the first thing to do is to contact the Secretary (see the Contacts page) and arrange a visit so that you can try the game for yourself. All you will need is a pair of flat-soled shoes. The club provides all the equipment, and there are plenty of mallets you can use. Croquet does not stop for rain, so you will also need waterproof clothing. 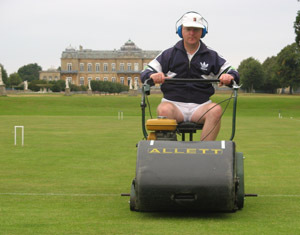 David Goacher (Bristol) lines up a rover peel to complete a triple peel and win the game during the Inter Club final at Wrest Park in 2007. One man went to mow - George Collin during a mid-tournament cut. We usually organise some formal Association croquet coaching at the start of each season for beginners, and members are always happy to provide one to one coaching on an informal basis. If you are a beginner you can learn a lot by simply watching a game with a more experienced player who can explain the strategy and tactics. We also have books that cover the game and show how the various shots are played. Ultimately, as in any other game, you will succeed through your own efforts, which means practice. The form consists of two pages. On the second page there is a section relating to the new Data Protection Regulation. If you have any questions about this please contact the Secretary. When you have paid your subscription you will receive a membership card and information on accessing playing equipment, use of the pavilion and so on. The club has an arrangement with English Heritage which allows club members free entry to Wrest Park house and gardens on production of a club membership card. Note that this concession is not available when EH are staging special events such as the St George’s Day Festival.